Martha Bennett was born on September 26, 1867, in Chillicothe, Ohio. 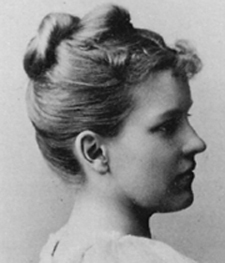 She spent two years at Radcliffe College studying Shakespeare under the famed Shakespearean scholar George Lyman Kittredge. Joining the faculty at Dana in 1896, Miss Bennett had a marked effect on the spirit and quality of the school. She taught English IV and V and the content of her courses relied heavily on her beloved Shakespeare. Miss Bennett was meticulous in her teaching of composition and rhetoric and equally meticulous in her use of red ink, which she used to correct compositions. From childhood, Miss Bennett was interested in dramatics and costumes. At Dana she often took the leading role in faculty plays such as “Bunty Pulls the Strings” and “The Old Lady Shows her Medals.” A talented creative writer, she composed a considerable body of poetry, much of which was created for holidays or feast days. At Christmas, she often would print in her own hand a Christmas poem she composed as a holiday greeting. A silhouette done by her brother, John, usually accompanied this poem. She was proud of the fact that she suggested to John, a well-known writer, the idea for his best-known work, Master Skylark. She retired in the fall of 1923, leaving Ferry Cottage where she had lived for twenty-seven years, and returned to Ohio. She passed away on January 9, 1961, at 93 years of age. Martha Trimble Bennett. Wellesley, MA: Dana Hall Archives. Martha Bennett, photograph. Dana Hall Archives, Wellesley, MA.